In mid-April, famed national security state journalist Glenn Greenwald gave a talk at the “Stop the Wars on Drugs and Terrorism” conference, held jointly at the University of Texas at Austin by the Future of Freedom Foundation and Young Americans for Liberty. In his speech, Greenwald made a point which, in light of recent events in Baltimore, cannot be emphasized enough. The war on terror, he said, must eventually come home. That is to say, perpetual warfare waged abroad will always creep back to the Homeland, manifesting on the domestic front in a number of alarming ways. Perhaps the most blatant example of this phenomenon is the now-infamous “1033 program,” wherein civilian police departments procure heavy-duty military weapons and hardware from the Pentagon. This program was created by the National Defense Authorization Act of 1997 (an act whose more recent versions Americans are now familiar with) for the purpose of transferring excess military equipment to domestic police forces. In 1997 alone the Pentagon gave 1.2 million pieces of military hardware to local police departments. And while the idea of the 1033 is to provide law enforcement used equipment from past military conflagrations, the hardware received in that program, as well as in a separate DHS grant program, is often brand-new. From mine-resistant armored personnel carriers, to fully-automatic MP5 submachine guns, to terrifying “acoustic cannons” straight out of an Orwellian nightmare, the American cop is now armed to the teeth, ready to wage a veritable war on innocents and criminals alike. 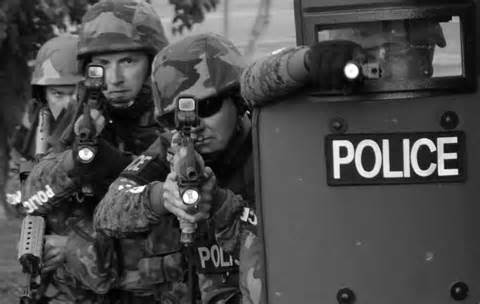 (Note the illustrative marketing slogan given to H&K’s MP5: “From the Gulf War to the Drug War – battle proven.”) Here, with the rapid militarization of police, the imperial warfare waged abroad blends seamlessly into domestic American society, finding a significant outlet in the War on Drugs. Indeed, it was the Drug Enforcement Administration (DEA), beginning in 1992, that beat the NSA to the punch with their own massive, bulk-collection surveillance program, targeting “virtually all” American telephone communications, as well as up to 116 foreign nations. The Drug War, among many other things, offers police departments a limitless number of suspects and perps, many of whom are apprehended in the course of a “no-knock” raid. Once reserved for special circumstances and crimes-in-progress, hyper-weaponized SWAT teams now execute tens of thousands of no-knock drug raids each year. As a consequence of the Reagan Administration’s sharp escalation of the Drug War in the 1980s, the number of SWAT raids conducted each year in America continues to rise substantially. The early 80s saw about 3,000 SWAT raids annually, with around 30,000 in 1996, and up to 40,000 by 2001. Read the rest via The Empire Comes Home by Will Porter — Antiwar.com.